These cute baby booties will cushion and warm your child's or grandchild's precious feet. 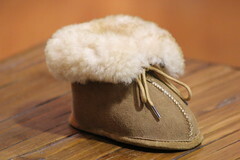 These booties are made of soft, cozy genuine sheepskin. We have designed them with your child's feet in mind - using pliable soft soles for when you toddler starts walking. You can be assured of quality detailing inside and out. 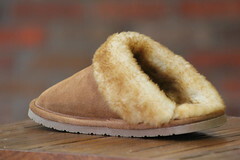 Braided cotton ties, reinforcement tab, nylon thread and a thick sheepskin lining that provides comfort and durability.